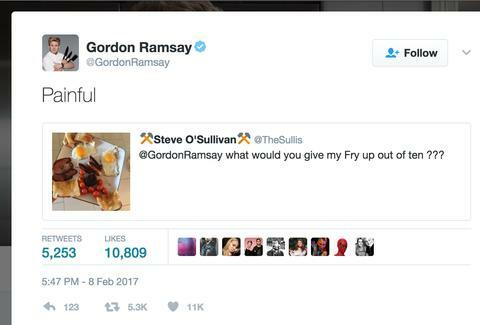 Gordon Ramsay isn't exactly a model of restraint or, uh, self-censorship -- just ask Jimmy Fallon. So, it should come as no surprise that the notoriously shouty chef is unleashing his blisteringly blunt flavor of criticism in response to fans' cooking photos on Twitter. And, yes, it's exactly as great as it sounds. Of course, it's probably safe to say at least a few people are trying to elicit vicious responses from the chef with the images their posting, which is also pretty funny. Anyway, tweet him at your own risk. Tony Merevick is Cities News Editor at Thrillist and is really tempted to send a photo of his next home-cooked meal. Send news tips to news@thrillist.com and follow him on Twitter @tonymerevick.